Een groot gemis voor Damanhur. Falco was een bijzondere man en heeft iets heel bijzonders neergezet; Damanhur. Falco, Oberto Airaudi, founder and inspiration of Damanhur, passed away on Sunday, June 23, 2013 at 11:12pm (23.12), in the nucleo community of Aval where he lived together with other Damanhurian citizens since 1980. Falco was 63 years old and had been sick for some months. In mid-March, in an article in Damanhur’s daily newspaper the Qdq, Falco alluded to the fact that health itself was leaving him, inviting – in his own, personal style – Damanhurians to gather tightly around their ideals with friendship and affection, which for years he indicated was the goal to achieve collectively. In the span of a few months his condition deteriorated rapidly, but Falco continued to carry out his commitments, including two weekly public gatherings – Thursday evenings and Friday afternoons – adding more events, courses and individual meetings with citizens. The intensity with which he lived until his last day, never missing an opportunity for humor, devoting all his energy toward increasing awareness and unity between people, are an example for all. In his last messages, he urged others to follow his example and give a personal contribution toward the achievement of a shared dream – Damanhur – and to continue the work in the Temples of Humankind, because, as he reiterated many times over the years, spiritual growth passes through the concrete and consistent support of that in which you believe in and in which you value. Falco invested his whole life in this. His extraordinary yet human, brilliant and sensible nature will forever leave an indelible mark on each of us. Falco was born in May of 1950 in Balangero, close to Turin, Italy, about forty kilometers away from the place where he founded the community of Damanhur. He tells about his childhood and awakening of consciousness in his latest book, Stories of an Alchemist, published in 2011. Even today, his mother Dovilia – who lives in Damanhur – still tells about how he was a lively child from early on, with interests outside of the norm. He had an endless desire to explore, understand, discover and communicate. As an adolescent, he began experimenting in unusual fields, developing a strong sensitivity and the ability to heal the pain of others. He attended a teachers college, and during that time he published his first two books: “Poesie dei miei sedici anni” (Poems from When I was Sixteen) e “Cronache del mio suicidio” (Story of my Suicide). He decided to leave his family early, becoming emancipated when he was 18 years of age (at the time, 21 years was the usual age), also becoming financially independent through his work as an insurance agent. He was probably the youngest Italian insurance agent when he married the mother of Valeria and Adriano, his children. In the 1970s, he intensified his research activities with various groups of friends in Turin and the surrounding provinces. In particular, he developed his ability to heal, gradually making pranatherapy his main activity. In 1975, after giving the insurance agency to his employees, he founded the Horus Center for Parapsychological and Esoteric Research in Turin with friends who were soon to become the first Damanhurians. From that moment on, the history of Falco is closely intertwined with that of Damanhur: the acquisition of the first land in 1977, the inauguration of the first nucleo community in 1979, the growth of the phenomenon that is Damanhur, the opening of the underground Temples of Humankind in 1992 (they had been built in secret since 1978), the international activities that Damanhur has been involved with since 2000. Falco was the inspiration and the animator of all this, even though since 1989 he no longer held any official roles in Damanhur. Until his passing, he remained a fundamental reference point, both for the esteem he received from Damanhurians and for being a volcano of ideas constantly in motion. In the years of the Horus Center, Falco introduced Selfica, the art of making objects based on the precise relationship between form and material which can catalyze and direct energies to their users. One of the branches of Selfica is Selfic painting, and painting had become Falco’s main activity, alongside pranatherapy. Falco’s works are found all over the world, in private collections of visitors to Damanhur who appreciated the paintings, and in solo exhibitionsin many cities including Moscow, London, Tokyo, Berlin and San Francisco. Falco has also written extensively, publishing thirty books, most of which have already been translated abroad. With the proceeds of these activities he has consistently supported the objectives of Damanhur. Similarly, he wanted his property and possessions to merge together with the Damanhurian properties. In private, Falco was shy and reserved. After he divorced his first wife, he remarried Sirena Ninfea, his life partner of thirty years. In addition to his first two children, who have both given him grandchildren, he had a daughter name Laene – who is now an adolescent, with Cicogna Giungo, with whom he had been in relationship with since 1984.
Who was Falco? For Damanhurians, Falco was a traveling companion who knew the way, the spiritual father who was often demanding and just as often available and supportive. He was a medium, a philosopher and a teacher, able to mediate communication between us and the great knowledge of humanity hidden in the folds of the universe. His spiritual vision greatly emphasized action and the realization of practical goals – and therefore the community, the Temples of Humankind and the many different Damanhurian activities – as a way to deepen knowledge of ourselves and of life toward the reawakening of our inner divinity, which he said dwells within every individual and connects us with the divine soul of the universe. The spiritual path he created – the School of Meditation – is based on dialog with others, on seeking communication with the forces that populate the universe, on the development of personal sensitivity, on the responsibility that everyone has towards his or her own choices. All this with a sense of humor, which he constantly reminded us of, because in order to achieve important things, it is also important to see the humorous side. To those who knew him “only” as a healer, artist and visionary, Falco was simply an out of the ordinary man, extremely curious and creative, and deeply human. Now that Falco is no longer here with us, his message and his work remains – he lives on within each one of us. His encouragement to build our community with vigor and imagination, to live this spiritual adventure without succumbing to the temptation to make it a religion that is rigid with dogma… they are the soil in which Damanhur will sow future events. The best way to salute him, even when in the emotion of this moment, is to continue building the Dream of a better world, with a smile, with optimism which, as he always taught, can bring out the best in every situation, even the most difficult ones. The connections that our Popolo has made with the Beyond will enable us to always feel him close and vigilant, together with our deceased brothers and sisters who have already been accompanying us on our path for some time, whom we will meet again sooner or later on this or other planes of existence. “There are many other adventures to be had…” he said to us recently. This salutation is a momentary one that we make with the certainty that what has been chosen in this lifetime will allow us to continue together in other lives, or in other dimensions of being. Today, it is with great sadness that we publish the news of his death, but it is a source of great joy to give us the chance to tell about his life and to continue his work, with the same energy, passion and love that he has always given. Hier is een prachtig filmpje over iemand die haar ervaringen vertelt met een zwaar mishandeld paard, hoe het paard haar spiegelt en helpt zichzelf te helen. Daardoor kan ze het paard, maar ook andere mensen helpen. Elke dag kies ik 2 kaarten uit de stapel SoulCollage® kaarten die ik heb gemaakt ( ik heb er meer dan 100). Deze kaarten hebben elk hun eigen enerige en vertellen mij iets over die dag. Ik zet ze neer zodat ik ze de hele dag kan bekijken en de energie die de kaarten bevatten kan ik meenemen gedurende de dag. Laatst trok ik bijvoorbeeld de kaart die ik over mijn moeder heb gemaakt (die niet meer leeft) op moederdag, samen met een andere kaart die over moederschap gaat. Zo bijzonder! Hieronder vind je één van de kaarten die ik vandaag trok, samen met de energie die het voor mij heeft. Ik ben degene die volop geniet, die zich openstelt voor het universum en die straalt. Ik sta in verbinding met het universum. Ik ben dankbaar voor alles wat er in mijn leven is. Ik heb vertrouwen in dat alles wat ik nodig heb naar mij toekomt. Ik voel me blij en vrij. Ik ervaar liefde en het leven stroomt door mij heen. Met dank aan alle fotografen en kunstenaars van wie we de afbeeldingen gebruiken om ons te inspireren en onze innerlijke en uiterlijke wereld te ontdekken en te hercreëren. Ik ben degene die danst vol passie en vuur, die zichzelf in de dans helemaal laat gaan. Die geniet van haar eigen lichaam en zich laat opzwepen door de muziek. Ik laat alle weerstanden los en geniet vanuit mijn tenen. Dit is een SoulCollage® kaart. In recent months many people have visited the SoulCollage® website because they entered the word COLLAGE into a web search. 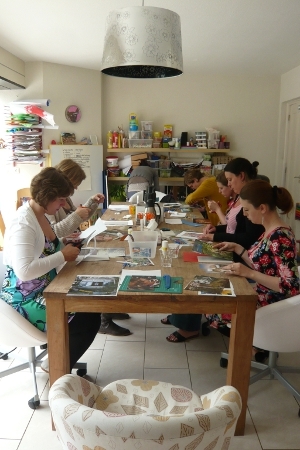 Some were artists already working with collage. Now several of these artists are trained Facilitators and are sharing the process of SoulCollage® with others in various parts of the country. 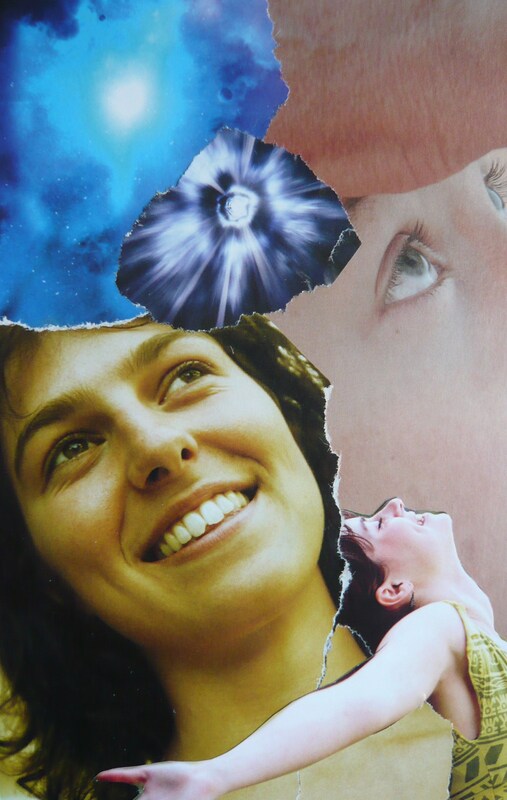 In this article, I thought I would speak to why, many years ago, I chose collage as the primary media for this creative form of soul exploration. As in all attempts to speak about Soul and Spirit, explanations will range from practical to symbolic, or, in other words, from our ‘local stories’ to the ‘Larger Story’. I’ll start with the first. Picasso seems to have coined the word collage. Certainly the etymological basis is the French word coller meaning to paste or to glue, and that is exactly what collage is: the creative act of cutting out and pasting down pieces, usually of paper. What is cut out and pasted is, quite often, an image. This image is cut out of its original context and imaginatively placed in a new context, one that the artist’s imagination devises. Collage is a simple, accessible sort of media; anyone can do it without years of training or expensive tools. Nonetheless it can still provide a surprisingly effective outlet for our creative drive. This easy accessibility is one practical reason I chose it. A second reason is this: collage is easily done in a group setting as well as alone, and working in a group can be helpful and healing. Besides, many of us won’t stick with a process that takes a length of time, unless we have a community of like-minded people to share with, and unless we also have regular times that we agree to meet. Thus gathering to both create cards and to work with them is a good way to keep SoulCollage® going in one’s life. 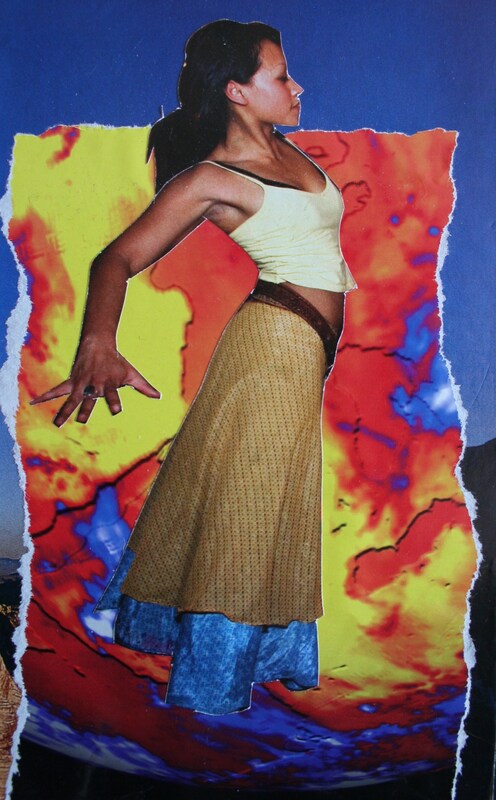 In SoulCollage® work we emphasize that our cards are made for personal use only, and are not created to be sold, or even traded. This principle underlines that this is a deeply personal deck of cards, created for one’s own use, for self-understanding, for healing and for just plain enjoyment. Hence you can cut out and use any image that is particularly numinous for you. You can use just one image on a new background, or put several pieces on one card. Whatever is right for you. You can, of course, show your cards, explain them, and “read” them (to answer your own questions) with other people. Now let’s think briefly about collage in a more symbolic sense. Notice how often in a day we collect pieces that exist in one context and arrange them in a new way. It is a fundamental, creative process we, as humans, constantly use. We do it with ingredients in our recipes, with furniture in our rooms, with words in our writing and speaking. The imaginative part in us does this selecting and piecing together with a special eye, or ear, or feel. We want the pieces to fit together in some sort of unity, a new pattern, perhaps beautiful, perhaps tasty, and perhaps meaningful. This creative imagining is so basic in our living that it may seem strange to lift it up as significant, and yet, if we do it consciously, it is a surprising and elegant activity that nourishes the soul. C.G. Jung, who spent much time with alchemy, noted that it was only by first taking a thing apart, getting to know its parts intimately, and then letting the parts come back together that transformation occurs. It is then that a new and more precious element is created. In like manner, our many pieces of soul can be consciously and imaginatively collaged into a new and more vital oneness of spirit. This is basically what we are about in the process called SoulCollage®. We select (or are selected by) images that are numinous to us personally, ones that are often mysterious. And we collage them onto a card. Aesthetics are fine, but that’s not our first priority, nor is being original. Even knowing what the image means to our life isn’t the first priority. This process is closely related to dream images. We collage a card like we might record a powerful and memorable dream, using imagination prior to analysis. Later we can work mindfully with the images just as we would analyze a dream. This is a powerful way of letting what is hidden within our depths bubble up, sometimes from our personal unconscious, and sometimes from that deeper layer in us that Jung called the collective unconscious. The numinous images on our cards can help us recognize and retain in a form vital parts of ourselves that we may not have known were there. Perhaps we will be challenged by them, surprised by them, and even horrified by them. But now we can understand them, accept them, and integrate them into our whole psyche. This is what Jung called the individuation process. We are a collection of opposites, shadow and light. Next to dreaming itself, using collage with numinous, found images is the best medium I know of to do this work. Seena B. Frost, M. 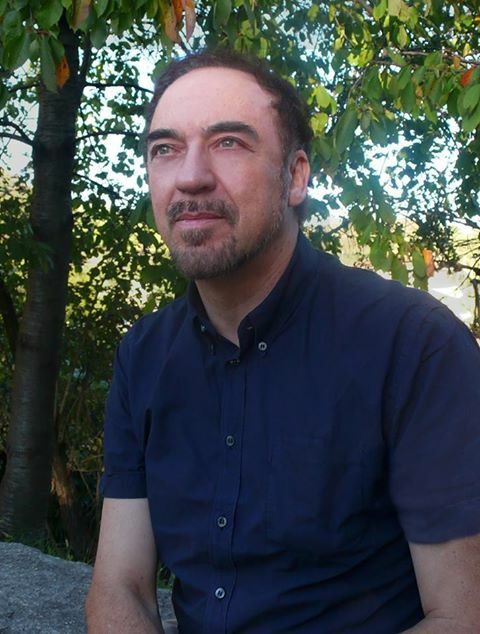 Div., M.A., author of “SoulCollage® Evolving”, studied theology at Yale Divinity School, married, raised four children, and then received a Master’s degree in psychology from Santa Clara University. She has been a psychotherapy clinician and supervisor in California for over thirty years, and has used many healing modalities including the work of C. G. Jung, Fritz Perls, Virginia Satir, Eric Berne, and others. Ik denk dat ik op het gebied van gezondheid en veranderingen (in positieve zin),afgelopen jaar wel veel geoogst heb. Laat ik maar eens beginnen bij Augustus 2010 waar het voor mij is begonnen. Je kan wel zeggen dat ik toen niet zo lekker in mijn vel zat en vaak wat gestresst was. In de periode voor Augustus 2010 had ik ook wel vaak maagklachten e.d.,waar ik toen het echt heel erg werd een keer s’nachts bij de apotheek omeprazol voor heb gehaald. In Augustus 2010 kreeg ik voor het eerst een zware paniekaanval. Ik kan het me nog als de dag van gister herinneren. Het leek alsof mijn lichaam steeds meer vol met adrenaline kwam te zitten,alle rust was weg. Ik probeerde een stukje te gaan lopen,douchen,op mijn bed liggen. Niks hielp op dat moment. Toen begon mijn hart sneller te kloppen,zweten,trillen. Ik dacht alleen nog ik moet iets kalmerends hebben. Toen heb ik de doktersdienst gebeld. Over de telefoon begon ik volledig te stotteren,ik voelde soort van energiestoten door mijn lichaam en tranen stroomden volop. De controle over mijn lichaam was ik volledig kwijt. Ik stond in mijn keuken en dacht echt dat mijn leven over was. Zo kan ik niet werken,vrienden willen me zo niet meer kennen. Ik ben toen naar de dokterdienst gegaan(ik heb me nog nooit zo klein gevoeld) tegen 2300 in de avond. Daar stelden ze wat vragen,namen mijn bloeddruk op en ik kreeg wat oxazepam. Daarna vroegen ze of ik nog even met iemand wilde praten,wat ik heb gedaan. Tegen 3.00 begon ik gelukkig eindelijk wat te gapen en moe te worden. De volgende dag en maanden zat het me nog steeds allemaal niet lekker. Ik bleef wel gewoon de normale dingen doen zoals werken,boodschappen,vrienden opzoeken. Ook al kostte dat soms best wel wat moeite. Ik ben nog eens bij de huisarts geweest en kreeg nog weer oxazepam mee. Dit heb ik de eerste maand wel eens gebruikt. Dit als ik het niet vertrouwde en 2 keer heb ik nog een lichtere aanval gehad. Medicijnen ben ik niet zo’n voorstander van en ik ben zelf naar oplossingen gaan zoeken op internet. Ik ben toen begonnen met eens wat yoga ademhalingsoefeningen en ik had een boek van e.f.t. (emotion freedom techniques) op internet gekocht. Langzaamaan had ik het gevoel dat e.f.t. begon te werken. Het gaf en creeérde rust. Tevens kon ik mijn dwangstoornis(extra dingen controleren zoals sloten deur,gas,kranen enz. om zo tot rust te komen) daardoor loslaten. Ik had daar al sinds mijn jeugd last van en heb dat nu kunnen loslaten gelukkig. Doordat yoga oefeningen en E.f.t. mij behoorlijk hielpen,ben ik in die richting verder gaan zoeken. Accupunctuur heb ik een keer gedaan en een aantal maanden na mijn aanval shiatsu. De eerste keer had ik behoorlijk hoofdpijn en last van misselijkheid. Gelukkig ben ik er mee doorgegaan en geniet ik er nu elke 2 maanden volop van. Ook heb ik een keer een aura healing en reading laten doen. Dat was ook erg interessant. Veel dingen wat ik voelde en van plan was in de toekomst sprak zij uit. Toen het allemaal wat beter ging,ben ik in mei 2011 begonnen met hardlopen. Dit ging eerst gepaard met wat blessures,waardoor ik tijdelijk niet kon hardlopen. Omdat ik mijn conditie op peil wilde houden,ben ik toen begonnen met zwemmen. Dit beviel ook erg goed en vanaf dat moment begon ik op zoek te gaan naar uitdagingen. Als ik nu ook eens ga fietsen,kan ik misschien eens een triathlon afstand doen dacht ik toen. In april 2012 ben ik begonnen met een beginnerscursus bij GVAV-Triathlon en heb daarna mijn eerste triathlon gedaan. Nu ben ik nog steeds lid. Toen ik langzaam aan mijn conditie steeds meer op peil had dacht ik erover om te gaan kickboksen. Dit was iets wat ik vroeger altijd al eens wilde doen. Momenteel doe ik het nu 3 maanden en ik vindt het geweldig om te doen. Het spelletje,de techniek en de energie die je er in kwijt kunt! In januari 2012 ben ik ook weer begonnen met gitaarspelen bij de muziekschool. Dit was iets wat ik 20 jaar geleden ook even had gedaan en ik ben blij dat ik het nu heb opgepakt. Ik kan nu een beetje spelen en noten lezen en geniet ook daar volop van. Wat ik ook heb opgepakt in november 2011 is een cursus meditatie en daarna nog een cursus in harmonie met de chakra’s. Dit bij het spiritueel centrum in Groningen. Dat heeft mij ook zoveel gegeven. Ik heb nu zoveel oefeningen om op terug te vallen,als het eens wat minder gaat. Door het simpel weg meer aanwezig te zijn in het hier en nu en door dankbaar te zijn voor zoveel kleine dingen ben ik zoveel gegroeid. Ook de leefregels van het boeddhisme spreken mij erg aan en ik doe mijn best om daar voor een groot deel in mee te gaan. Ik geloof nu dat uiteindelijk alles altijd goed komt en als je iets echt wilt gebeurt het wel. Toeval geloof ik ook niet meer in. Ik heb het idee dat alles wel gebeurd met een reden. Iedere morgen als ik wakker word,ben ik dankbaar voor de nieuwe dag. Doordat ik me nu van binnen zo goed voel,wil ik ontzettend graag anderen helpen op de wereld. Als ik luister naar mijn hart,geeft hij dat ook duidelijk aan. Ik heb voor mezelf ook een lijstje gemaakt met dingen die ik wil doen. Zoveel dromen,plannen en dingen die ik nog graag wil doen. Men zegt ook altijd dat de tijd vliegt maar van afgelopen jaar is me zoveel bijgebleven door meer aanwezig te zijn. Hierdoor lijkt het niet zo snel te zijn gegaan maar het is wel mijn mooiste jaar van mijn leven geweest. En ik voel dat dit nog maar het begin is. Raar dat ik iets meer dan 2 jaar geleden het idee had dat mijn leven over was en me nog nooit zo slecht had gevoeld. En nu heb ik het idee dat het echte leven is begonnen en heb me nog nooit zo goed gevoeld. Nu mezelf alleen af en toe nog wat afremmen ;). Mijn grootste droom op dit moment is toch om vrijwillig werk in het buitenland te doen. En ik had bedacht om als ik volgend jaar 3 weken naar het buitenland ga op vakantie,dat te combineren met vrijwillig werk. Waar het op dat moment dan nodig is. Of het nu een weeshuis opbouwen in Ethiopié is of schildpadden redden in Costa Rica of helpen na een aardbeving in Azié. Ik ben er iig klaar voor! Het eerste verhaal is al binnengekomen, ontroerend om te lezen en ik hoop dat er vele meer mogen volgen! Bericht uit het hiernamaals …. In de ochtend loop ik met mijn beste vriend Marcel en de hond Frodo door een bos. Het is mooi, zonnig weer. Een strakblauwe hemel en geen wolkje dat de sfeer komt storen. Ragfijne spinnewebjes als zilveren kettinkjes hangen over het groen. De dauwdruppels lijken haast pareltjes. Het is zo vredig, zo stil, zo mooi. De intense kalmte doet me deugd. Plotseling waait één of andere geur me tegemoet en herinnert me aan mijn grootmoeder. Het brengt me terug in mijn kindertijd en één moment lijkt het alsof ik mijn grootmoeder in mezelf voel, alsof ik haar … word. Een vreemde, prettige ervaring. Ik vertel Marcel wat ik voel en zeg hem dat ik de laatste tijd vaker het gevoel heb dat ik weldra meer en meer contact ga hebben met diegenen “aan de andere kant”. Een eindje verder, na een flauwe bocht, komen we opeens in een totaal ander decor. Een paarse vlakte … dopheide. De tranen springen me in de ogen van ontroering. Ik wist niet dat het me zo erg zou aangrijpen. De heide die een jaar geleden voor een flink stuk afbrandde in de plaats waar ik woon, waardoor zoveel kapot ging en als dood achterbleef liet een spoor van verdriet na. Het verbaasde me toen reeds dat ik er zo kapot van was. Nadien was ik bang terug op de heide te komen net omdat de paarse schijn verdwenen was. Dat alles gaat door me heen terwijl ik daar sta te kijken naar een vlakte vol bloeiende hei … in al haar glorie. Zo sprookjesachtig mooi. Ik begin te huilen. Een mix van gevoelens overspoelt me. Verdriet om wat verloren is maar ook vreugde om wat er nu is. Een super begin van de dag ! De namiddag brengt me naar de wijk Heide waar die dag het jaarlijkse straatfeest gehouden wordt. Elk jaar opnieuw is de zon van de partij. Samen met een vriendin fiets ik ernaar toe. We stallen onze fietsen en terwijl ik mijn handtas uit de fietszak neem, gaat mijn mobieltje. Te laat ! Ik merk dat ’t mijn zoon Chris is en bel hem terug. We hebben pas recentelijk opnieuw contact na bijna drie jaar zo goed als niets. Het is een pril en kwetsbaar begin. Mijn kleinzoontje Matthieu heb ik nog niet gezien. Ik weigerde het in eerste instantie omdat ik het niet nog eens aankan hem één keertje te zien en nadien niet meer. Dat zou ik fysiek noch mentaal aankunnen. Ik bel hem terug en Matthieu neemt op. Mijn eerste gesprek met mijn kleinzoon ! Uiteindelijk krijg ik Chris te spreken en vertelt hij me dat hij eind van de week terug zal bellen om wat gerief op te halen. Ik zeg hem dat ik in Heide op de straatfeesten ben en of zij meestal niet ook aanwezig zijn. Zijn vriendin Anke is erg moe want ze is opnieuw zwanger en zaterdag was een erg belastende dag geweest. Ze beslissen om thuis te blijven. Een half uurtje later krijg ik een berichtje dat Chris met Matthieu naar Heide komt. Mijn hart bonst in mijn keel. Eindelijk zal ik hem kunnen zien. De herinnering brengt een krop in mijn keel en achter mijn oogleden prikken de tranen. We zetten ons op een terrasje in de zon en korte tijd nadien zie ik Chris met aan zijn hand …. Ik word dertig jaar terug in de tijd geslingerd…. Alsof mijn zoon opnieuw geboren werd en daar komt hij op me af. Net vier jaar geworden. Als twee druppels water ! Hij kijkt me met grote ogen aan en lijkt niet van plan om een stap naderbij te komen. Chris zet zich bij ons en schoorvoetend komt Matthieu dichterbij. Hij heeft een ballon in zijn hand en die zorgt voor de nodige ont-spanning. Ik speel een beetje met hem al plagend en hij neemt onmiddellijk het spelletje over en doet mee. Chris vertelt hem dat ik zijn mama ben. Matthieu kijkt me aan en schudt ontkennend zijn hoofd. “Dat is mijn papa”, zegt hij. “Ja”, zeg ik “en jouw papa is mijn kindje”. Weer schudt hij van nee. Hij gelooft er niks van. Iets later beslissen we om met ons drietjes naar de kermis te gaan want Matthieu heeft autootjes gezien waar hij graag in wil. Twee keer en hij zal zelf wel voor de kaartjes zorgen als wij hem het geld maar bezorgen. Zelfverzekerd doet hij wat hij moet doen, legt met een achteloos gebaar de rest van ’t geld in de hand van zijn papa en loopt naar het autootje waar hij absoluut in wil zitten. Wij staan aan de kant toe te kijken. Ik vraag Chris hoe ’t met zijn vader gaat. “Goed” zegt hij. Op dat moment komt een jonge vrouw op me toegelopen met een kaartje in haar hand. Ze vraagt of ze ’t me mag geven waarop ik bevestigend knik. Ze legt het in mijn hand, draait zich om en loopt weg. “Home party”…. Chris kijkt ook en zegt … “mama, zie je dat ?” Het adres is waar zijn grootmoeder, de moeder van zijn vader waarover we net spraken, woonde. Ze is drie jaar geleden overleden. Ik heb haar vaak gevraagd, gesmeekt … of ze er toch voor wou zorgen dat ’t tussen Chris en mij terug goed zou komen. We staan beiden sprakeloos. Moemoe laat weten dat het feest is thuis. Ze is van de partij. Homeparty !